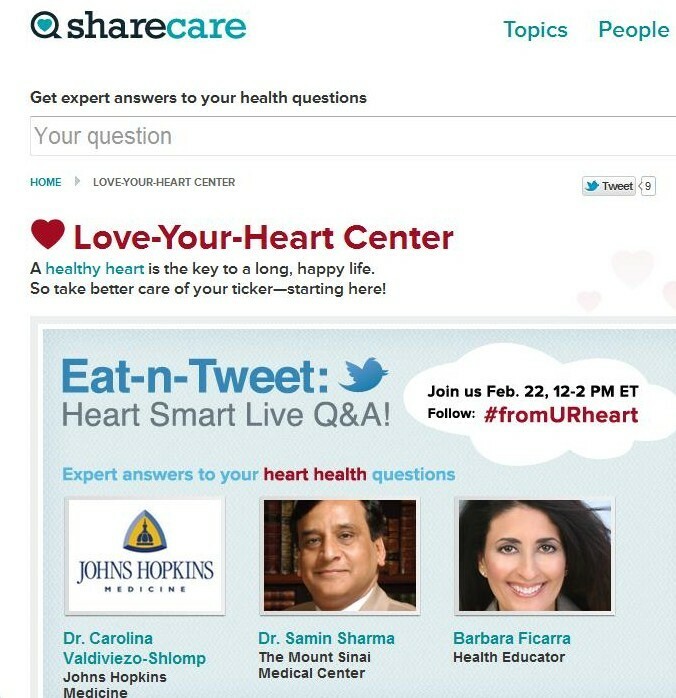 Join us today, February 22, 2012 from 12 p.m. to 2 p.m. EST (9 a.m. to 11 a.m. PST) for Sharecare’s Twitter chat on heart health. Dr. Carolina Valdiviezo-Shlomp from Johns Hopkins and Dr. Samin Sharma from The Mount Sinai Medical Center will answer your questions. As a health educator, I’m thrilled to be part of the twitter chat to help guide you with trusted information. Heart disease is the number one killer of women. Learn about prevention, questions to ask your doctor and nurse practitioner, find out what numbers you need to know, plus more. Have you participated in a twitter chat?